For a cheeseburger in paradise Makin the best of every virtue and vice. ASPEN  The Jimmy Buffett song, though Anot exactly kosher, glorifies a cheeseburger in paradise. Rabbi Mendel and Lieba Mintz have learned how to live in paradise quite well without cheeseburgers, but also without the kosher amenities that many Orthodox Jews take for granted. The Mintzes are Chabad emissaries (shluchim) in Aspen, an idyllic ski and summer resort nestled in the Roaring Fork Valley of Colorado with a population of 6,700. Located in west-central Colorado, nearly 200 miles from Denver and more than 400 miles from Salt Lake City, Aspen is what youd call in the middle of nowhere, albeit a beautiful nowhere. The intrepid Mintzes came to Aspen 14 years ago at a time when Chabad emissaries were mostly serving in larger cities and some college towns. In Colorado, Chabad rabbis and their wives were then only in Denver and Boulder. Venturing to the isolated mountain town was a leap of faith which required resourcefulness and creativity to maintain an observant Jewish lifestyle. The first question one might ask is how and why did they choose to move to Aspen? Youthful idealism and the climate had a lot to do with it. There were some people here with an interest in starting a Chabad, a couple of locals, visitors and second homeowners. I heard about it, recalls Rabbi Mintz. Rabbi Mintz had been in Colorado only once at age 20 for a veterans camp at Denvers JCC Ranch Camp for the Aleph Institute, a Chabad-affiliated organization that helps people in the military and prisoners. We fell in love with Aspen, and thought there was enough of an opportunity here, says Rabbi Mintz. We were concerned about how isolated it was, and how distant it was. Both of us come from very large families and are very close to our families, and that, too, was certainly a concern. Also, how would we educate our future family? THE Mintzes took on the challenge and moved to Aspen in the summer of 2000. 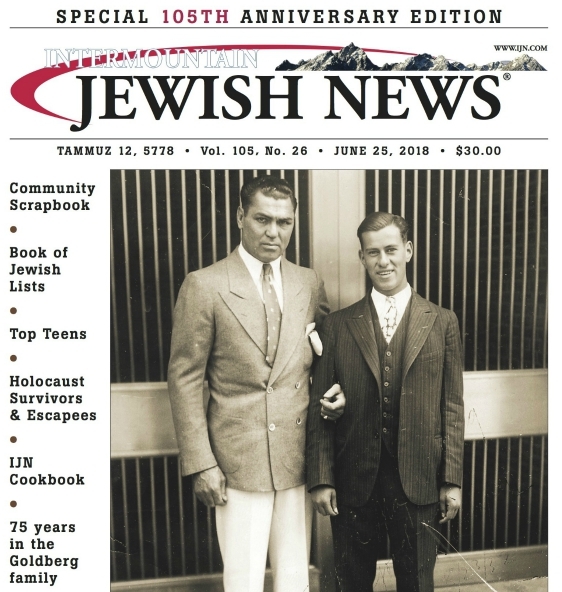 Part of the missing family issue was eventually alleviated for the young couple when two of Rabbi Mintzs brothers, Avraham and Dovid and their wives, and Liebas sister Shaina and her husband Rabbi Yaakov Borenstein followed their siblings to Colorado to open Chabad Centers in South metro Denver, Vail, and Longmont, respectively. Rabbi and Mrs. Mintzs parents come to Colorado from their homes in Crown Heights, Brooklyn, for every simcha and some holidays, and their other siblings come and go for simchas, ski vacations and other getaways. The greatest training Chabad gives you is that youre thrown into many different foreign places at a young age. One of the classic concepts that the Rebbe [the late Rabbi Menachem M. Schneerson] taught is that every human being is unique and special, so there was a great respect for whomever you met and whenever you met them. That helped. Even at a young age, we spent times in distant places, summer camps, even in our late teens. So nothing was a complete shock. The different shock is: When youre young and single, its not permanent. Anyone can do anything for a period of time. They were also inspired by the previous generation of Chabad emissaries who in the 1950s and 60s ventured outside the New York area for the first time, often to areas that were not welcoming to Jews. NEVERTHELESS, the Mintzes have had to overcome several obstacles caused by their isolated locale in order to pursue a Torah-observant lifestyle. We always manage to find what our local grocery store has. For the kosher meat items, kosher chicken and dairy items, we go to Denver often. We make Deli trips once a month, she says, referring to the East Side Kosher Deli. The Mintzes also travel a great deal, so they also buy kosher meat and other goods whenever they are in a metropolitan area with kosher markets. Rabbi Mintz: We fly at least monthly. Because so many of the Aspenites live elsewhere, we go to them for Bar Mitzvahs, weddings. So many of our congregants are part-time, so many of these events are in other cities, sometimes simchas, sometimes funerals, so if its anywhere near a major city, we stop, get what we need. We can check in two boxes. If its two of us, four boxes. We will also often use a courier. That keeps us pretty well stocked up. The Mintzes have several freezers. They do not eat a lot of meat and chicken themselves, but they have many guests nearly every Shabbat, so they have to be prepared with mass quantities of food. A downside to being the most observant kosher family in town is that the Mintzes must prepare almost every meal they eat. Theres very little eating out. There are a few kosher second homeowners in Aspen, and the Mintzes will eat in their homes on rare occasions. We eat out only once or twice a year, says Mrs. Mintz. Some people want to hire a kosher chef to cook for us, but its hard to supervise them. So our general rule is, when people invite us, we have them come to us, the rabbi adds. The new Chabad JCC in Aspen  which is scheduled for completion early summer  will have a conference center, a full-time chef and a kosher take-out. I told Lieba I can finally take her out for lunch when we have our chef in the new building, the rabbi says. The new Chabad JCC will have a mikveh, and thats a big deal, because until now Lieba has gone Denver or to another city to fulfill that monthly mitzvah. Mrs. Mintz generally doesnt stay overnight in Denver because she has other kids at home. But there have been times when I-70 has been closed due to weather and she has had stay overnight. Fortunately, her sister Shaina lives in Longmont, plus Mendels brothers are in Vail and Lone Tree, in case she gets stuck. THE third part of the adaptation equation for Rabbi and Mrs. Mintz is the education of their children, and that is being addressed satisfactorily, thanks to technology. The Mintzes are the parents of five: Toby, 13, Isaac, 12, Levi 9, Chaya, 7 and Ita, 16 months. Because they live more than a four-hour drive from the nearest Jewish day school, the Mintz family qualifies for enrollment in the Shluchim Online School, a Chabad-run Internet Judaic studies school for the children of emissaries and others who live in remote places. The school started approximately eight years ago, just at the time when the Mintzes needed it for their oldest daughter Toby. Prior to that, children in such families studied via telephone. The four oldest children go the Aspen Chabad House every morning for school. There is a classroom in the Chabad center equipped with computers, headphones, web cams, scanner and fax. The school is divided into two US zones: east and west, with Colorado students going to the west school. Classes are conducted live by different teachers  who can be located anywhere in the world  for various subjects and grade levels. With web cams, teachers and students see other, and the students can see all the other students in the class. Attendance is taken for every class. The kids scan their paperwork and email them to the teachers as soon as they are finished. Except for the lack of a brick-and-mortar building, Mrs. Mintz says its just like any other school. For secular subjects, Toby, Isaac, Levi and Chaya are enrolled in COVA, Colorado Virtual Academy, a free, online public school system for Colorado residents. Its amazing, Mrs. Mintz proclaims. They send you all the books, paint, markers, glue and everything thats required. The kids were just tested this week for the CSAPs. Its not live; you can do it on your own schedule, which works for us. I bring in two Chabad girls to help me with programming, and they teach the kids. I also have tutors for math and science. Its intense. It keeps the kids here a full day. They leave the house at 8:45 a.m., and theyre not done until 4:30 p.m.
For the Mintzes, this system is working. Theyre on par with the brick-and-mortar schools, Mrs. Mintz says. At times, they have sent their oldest son Isaac away to a yeshiva for a month at a time, and he fits right in, his mother says. Social needs are met with hockey, soccer, gymnastics, baseball and other activities. His parents say that half the kids on Isaacs hockey team are Jewish. The Mintz children ski every Sunday in the winter, and they hike with their father in the summer. My two oldest have even biked to the Maroon Bells already. I dont know how many Brooklyn kids who can bike eight miles up a hill, says Rabbi Mintz. Theyre definitely Colorado kids, their mother says with a smile. ONE of the most difficult aspects of the Mintzes life is the social isolation. Its not for the lack of people to spend Shabbat and holidays with. In fact, its quite the opposite. While its rewarding that hundreds of people are attending a seder and celebrating Pesach, it also has an element of loneliness that youre not with your [extended] family, Rabbi Mintz explains. ?They are not able have intimate holiday or Shabbat meals with their own children due to the nature of their positions as Chabad emissaries. Rabbi Mintz leads seders for 350 people. Both first- and second-night seders are communal. Its not something that I wanted to do initially, but there are so many people who need it and want it, Mrs. Mintz says. The Mintzes and other families in their situation also deal with the social isolation by participating in the annual Chabad conferences, held separately for men and women. Its good to connect with friends and other people in isolated areas. To the conventions credit, they have different sessions and seminars based on what your challenges and difficulties may be, says Rabbi Mintz. There is a new division of Chabad for isolated communities, featuring weekly conference calls and monthly video chats. You get a couple of people under your wings and help them, like a support group or mentoring program, Mrs. Mintz says. The group is limited to those who live outside of a two-hour drive from a Jewish day school. Living in a small town, far away from a major Jewish population center definitely has its challenges, but its something Rabbi Mendel and Lieba Mintz signed up for. Sometimes, they feel the loneliness, but overall they find their work and life in Aspen rewarding and worth the sacrifices. As Rabbi Mintz puts it, Its hard to walk or drive down the street without somebody yelling, Hey Rabbi. Thats the beauty of this town. One of the beauties of being in an isolated area is when youre in a major city  lets use Denver as an example  if someone doesnt like or has a struggle with one rabbi or shul, you have a dozen options. Here, you may not have the quantity, but you have the quality. You look at the quality of the person. Every meaningful relationship is a cog in the wheel of a strong Judaism.